Home > Sports > Jump around! The average height of a vertical jump is anywhere between 12 to 20 inches, according to TheExercisers.com. That’s good for a hang time of just over half a second, equal to the amount of time it takes for a windshield wiper to shrug away a layer of rain before returning to its original position. 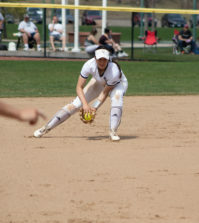 It may seem like a narrow window of time, but for Quinnipiac freshman Ali Bottari, a lot can happen in half a second. Just give her a jump rope and watch. Armed with her red, white and blue beaded cord, Bottari has made a habit of dropping jaws with her ability to create and amaze through her split-second hops. 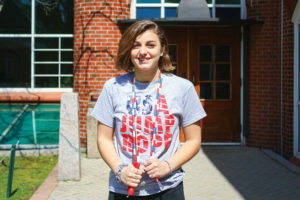 She has taken her jump rope everywhere from her elementary school in Torrington, Connecticut, to the World Jump Rope Championships in Sweden, with a pit stop at the Macy’s Thanksgiving Day Parade in New York City. Of course, Bottari doesn’t travel around the country (and sometimes the world) to simply jump rope in place. Her freestyle routine consists of acrobatic handstands, full front flips and between-the-legs crosses that seem to defy every sense of physics, all while keeping the rope steadily rotating over her short brown hair and beneath her feet. “You kind of have to see it to believe it.” Bottari said. She’s not wrong. In fact, “see it to believe it” is the headline slogan of USA Jump Rope. Competitive jump roping takes a mundane exercise routine and turns it on its head (sometimes literally). Bottari, a film, television and media major, laughs when the comparison of her sport and the movie ‘Jump In’ with Corbin Bleu is brought up, as her routines rely much more on tricks, speed and endurance rather than a jumping dance. So how did a Connecticut girl like Bottari find her way into the world of competitive jump rope? For the people of Torrington, the sport is embraced as the local holy grail, a slightly lesser version of high school football in Odessa, Texas. The sport is a foreign language to most, but in Torrington, home of the Forbes Flyers jump rope team, it’s everything. 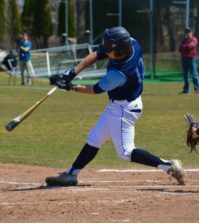 At Forbes School in Torrington, kids are eligible to join the Flyers once they reach third grade, and can remain part of the team as long as they wish, which some take full advantage of. Bottari remembers a parent of one of her classmates who still competed with the Flyers at the ripe age of 50. Navin isn’t alone. 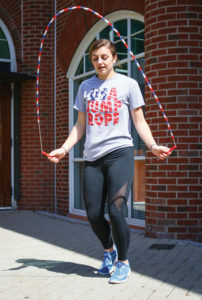 Jumping dominates the lives of many in Torrington, who practice for two and a half hours every day after school, with two morning practices a week also thrown into the mix, before the sun has risen above Forbes’ red brick building. 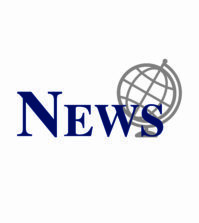 Bottari, Navin and the Flyers compete annually in the USA Jump Rope regional tournaments held across the country, which culminate in the Nationals tournaments every summer. Bottari and Navin have enjoyed plenty of success on the biggest stages, including a first place finish in the 2016 Nationals tournament, resulting in a Grand Nationals Tournament appearance. “It was an honor to get there, and it was one of my favorite moments ever in jump rope.” Bottari remembered. The duo’s impressive 2016 finish was another addition to Bottari’s crowded list of accomplishments, which includes a Grand Nationals qualifying performance in both singles freestyle and double dutch freestyle, where two teammates each hold one end of the rope with a jumper in the middle. Bottari’s double dutch group scored a remarkable third place finish at Grand Nationals in 2015. 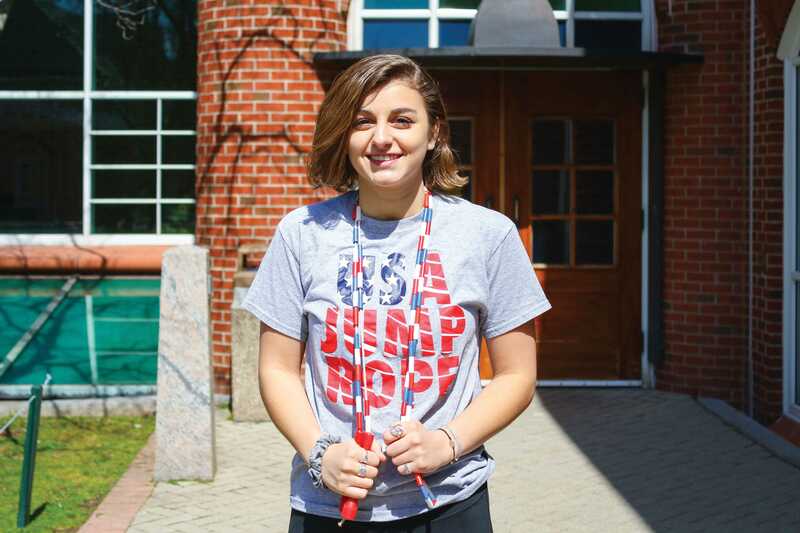 One of Bottari’s most treasured jump rope memories came almost 4,000 miles away in Malmo, Sweden, where she competed in the World Rope Skipping Championships in 2016. 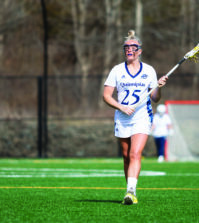 Back in Western civilization, Bottari struggles to prepare for this summer’s Nationals tournament while balancing college life at Quinnipiac. Aside from attending a workshop in Tennessee with the USA All-Star team last month, there hasn’t been much time to pull out the rope and work on her craft. Maybe she can squeeze some time in here and there, but in Hamden, it doesn’t feel the same. For Bottari, it gets lonely. Navin would concur, as she struggles to find the motivation to train while at school in South Carolina. “Jumping by yourself is kind of boring when you’ve been doing it with other people for so long.” Navin says. Fortunately for Bottari and Navin, they won’t have much longer to wait before they are reunited. After the semester concludes in May, Bottari will take the hour drive back to Torrington to begin her daily training for Nationals and revitalize herself in the sport that she believes is unparalleled and criminally underappreciated. Here in Hamden, competitive jump rope is considered trivial to almost everyone but Bottari. Who would have known that just a hop, skip and a jump away in Torrington lies the center of the jump rope universe?